Plot – After the death of his close friend, tormented Luke (Spall) and a group of his close friends head to the wildlands of Sweden to pay homage to their lost friend’s memory only to find themselves deep in the woods and facing a potential life and death situation as they discover they may not be alone in their secluded surrounds. One of the more competent Netflix horror releases that has found its way into our living rooms, David Bruckner’s The Ritual is an atmospheric and layered production with more to say than your average jump scare experience and while it goes off the deep end towards its later stages a few too many times, horror aficionados should be well pleased with his haunted woods experience that’s deeper than you’d first expect it to be. 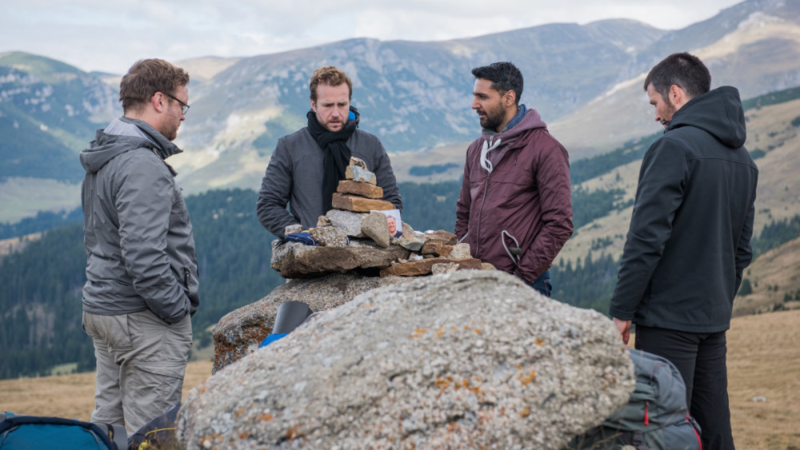 Focusing its attention on Rafe Spall’s tormented Luke, a depressed and conflicted figure who is reeling from the violent recent death of his close friend Robert that he feels responsible for, The Ritual see’s Luke and his group of “mates” head off into the wilds of Sweden to go hiking and pay homage to Robert’s memory, only to find themselves deep in the woodlands and in a spot of bother when they realise they may not be alone in their isolated surrounds. It’s not what appears to be a particularly original concept and Bruckner can at times find himself playing a little too close to genre conventions but with Spall impressing in the lead role and The Ritual sometimes genuinely surprising with its musings on fear and overcoming one’s self-doubt, Bruckner’s experience is one that overcomes its shortcomings to become an engaging watch. Filled with some undeniable dread filled anticipation and a collection of scenes that will have the hairs on the back of your neck standing to attention, Bruckner shows skill as a filmmaker that can create a mood and a setting to work as another character in his film and while at times Luke’s comrades like Sam Troughton’s Dom in particular begin to grate, the atmosphere in which Bruckner has managed to conjure up is top notch, while horror creature fans might have just found their 2018 MVP with The Ritual’s big bad. While it doesn’t rewrite the rulebook and some potential scares go by the wayside, The Ritual is an enjoyable and often gripping low-budget horror that features another impressive Spall turn and marks down another above average effort from director David Bruckner.